Welcome to my series blog about the new television show Humans. Each week I will be reviewing the latest episode and hopefully some of you will join me below the line to discuss your thoughts on the show and where you think its twists and turns will take us. Warning may contain spoilers. Shortly before the first episode aired Channel 4 ran a series of adverts that apparently duped a few viewers into believing that synthetic lifeforms were now available to purchase. This brings to mind the story of Orson Welles’s radio play version of War of the Worlds where listeners truly believed that what they were hearing was a description of a real alien invasion. And from the first scene this is what Humans does very well, it draws the viewer into a realistic world, based in the near future, where the line between the technology we have available now and the technology we could have soon is extremely thin. This makes everything very believable. Based on a Swedish drama, Humans is an exciting sci-fi show that had me hooked from the opening minutes. If the first episode is anything to go by Humans is going to be an intelligently written and thoughtful slice of near future dystopia that will pose the viewer challenging questions. It will also contain an intriguing thriller at the heart of the story. Joe Hawkins (Tom Goodman-Hill) seems like a normal guy, he’s just a man trying to look after his family and he is a little frazzled attempting to tidy up after three children, so he knows the perfect solution; order a synthetic, not a top of the range model mind you, but a model that can tidy up the home and be especially efficient at lining up shoes. This is where we meet Anita (Gemma Chan) and one person who takes to her straight away is little Sophie (Pixie Davies) and why wouldn’t she, Anita can read a bed time story to her without being in a rush, so obviously Joe’s wife Laura (Katherine Parkinson) takes a strong dislike to their new domestic helper. But is there more to Anita than meets the eye and what’s her fascination with the moon. We also meet George (the excellent William Hurt) and his out of date android Odi (Will Tudor). George refuses to get Odi upgraded because he contains memories of his dead wife. George may also be suffering from dementia so Odi is his only link to his wife and the scenes between these two are brilliant and particularly poignant. When George refers to Odi as son you see what his feelings towards him really are. This gives an insight into the emotional complexities inherent in introducing such synthetic lifeforms into society. Tensions increase in the Hawkins’ household as Laura is more and more uncomfortable with Anita and her apparent fascination with Sophie. Anita accidentally scalds Laura with a baking tray, calculating the risk of doing so versus the greater risk of hurting Sophie. She explains the logic of her decision but Laura is not convinced. We are introduced to Leo (Colin Morgan) in a scene that takes place 5 weeks before Anita’s arrival with the Hawkins. Anita and Leo are possibly in love and Leo is leading a group of synthetics to a camp in the woods. Anita is then kidnapped by unknown powers. Are they linked to Hobb (Danny Webb) who is concerned with hunting down all of Leo’s rag-tag band of “feeling” synthetics. Throughout the episode we see Leo try to track down all of his android friends, even though he is human (or is he and why is he injured?) and we are left with lots of questions and mysteries that hopefully will be delved into in future episodes. Who invented the synths and how can some of them feel, who is Leo, who is hunting them and why at the end of the episode does Anita kidnap Sophie Hawkins? We see a world where the majority of manual labour is now carried out by a synthetic workforce and we see that life living alongside these new lifeforms is not as straightforward as first imagined. When reading about TV or films you may have come across the term “well worn trope”, meaning recurring themes that appear so often they become cliché. The reason big themes re-occur, especially within the sci-fi genre, is that these are the stories we as humans (pun intended) want to hear, they engage us and speak to some deep fear or moral interest. When you look at the concept of Humans on paper it is easy to view it as a very well worn sci-fi trope. The idea of artificial intelligence taking over or computers gaining sentience has been around for years. In fact Odi reminds me of another old tale about something non-human wanting to be a real person, Pinocchio. But whether it is Pinocchio or his science-fiction cousin, Data from Star Trek, we have seen this story before. 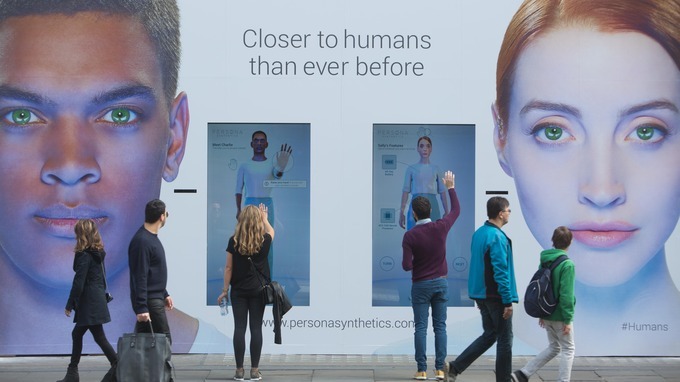 Humans brings a freshness to this concept and acknowledges that this is an old story by making a cute reference to Isaac Asimov (writer of I, Robot) mentioning the Asimov Module, which is a component of the synthetics that feature in Humans. Humans is not clichéd because it has good writing and brilliant acting, so brilliant in fact that it was only at the end of the episode that it occurred to me that the androids were played by actors, their movements were sensational and every part of me believed that they were machines. I am very optimistic about the rest of the series because episode one was thoughtful and well paced, giving this viewer enough mystery to want to find out more. I am looking forward to episode 2 and would like to know your thoughts about this episode and your hopes for the rest of the series. Let me know what you think in the comments section and see you next week.